Why Are We So 'Starstruck'? Starstruck is a succinct account of the commercial apparatus behind those stars whom we seek to uplift, observe, and emulate. 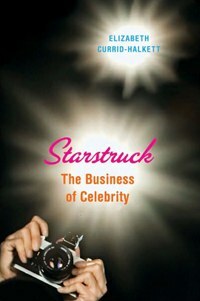 Publisher: Faber and Faber, Inc.
Elizabeth Currid-Halkett’s Starstruck is a straightforward and succinct account of why some successful people like Bill Gates or Warren Buffett are merely famous yet others possess a certain “celebrity residual” that almost compels the public to be obsessively curious about their daily comings and goings. Not limiting her analysis to stars like Jennifer Aniston and Paris Hilton, Currid-Halkett also discusses the artists Jeff Koons and Damien Hirst and sports stars Alex Rodriguez and David Beckham, among several others, to illustrate the value of creating that “something extra” in a public persona. The book, however, is more about the commercial structures that gives rise to today’s celebrities than about why we are so captivated by those who stand before the flashing lights, that is, why we are so starstruck. For a partial answer to this latter question, I refer the reader to Daniel Herwitz’s The Star as Icon: Celebrity in the Age of Mass Consumption or work in the recently launched Celebrity Studies journal. Currid-Halkett uses social network analysis, interviews with leading publicists, and other approaches to probe the business dynamics that seek out and nurture what she calls “the special quality that some individuals possess that propels society to care more about them than about other people.” Rather than try to articulate a new theory of contemporary celebrity, the book’s core conceptual contribution is its idea of a “celebrity residual”, the extra flare in a uniquely crafted persona that strongly resonates with a segment of the public. The author repeatedly returns to the case of Paris Hilton, who seems to work so hard to keep herself in the spotlight despite very limited acclaim for her acting or musical talent. I bristled, however, at the casual lumping together of Paris Hilton with Edie Sedgwick. Although they can both certainly be seen as fame-seeking heiresses, in no way can I imagine Hilton playing Sedgwick’s roles in Lupe, Beauty No. 2, or Face. Obviously, a whole monograph could be devoted to the question of how social media like Twitter, Facebook, and YouTube are changing the careers of cultural producers. As Currid-Halkett writes, they “demonstrate the purest form of cultivation of celebrity because, for the most part, their entire purpose is to feed us unessential personal information.” Having written a dissertation on the careers of the highest ranking “stars” of the Army officer corps, I appreciated the section where a UK-based publicist tells the book's author, “You can be famous, but do you have a career? You can be on YouTube and have twenty million hits—but will twenty million people pay a dollar? Business is what it’s all about. You can’t pay your grocery bill with a cutout from a newspaper.” This tension between online popularity and building a sustainable career begs for the kind of empirically grounded analysis that Currid-Halkett is trying to develop as well as a meaningful theoretical account of why we seek to uplift, observe, and emulate those among us who have that extra bit of sparkle.